Last week I was sitting at my girlfriend’s house deciding which pizza(s) we should order (because who can get just one, right?). Being the savvy shopper I am, I opened up my Pizza Hut app and started searching through their deals, finally deciding on two $11 anything you want pizzas. I piled on ingredient after ingredient, watching my calorie-drizzled creations come to life in my palm-sized pizza shop. After approving my order, I selected my payment options and waited for the delivery driver—mission accomplished. Now that we are a mobile culture, having a restaurant at the push of a button is convenient and saves time–something that no one has enough of. I believe that restaurant apps are becoming more and more of a necessity as our society continues to change. To gauge people’s thoughts on this, IH Concepts conducted a survey on restaurant apps and the expectations that come along with them. Of the 30 people surveyed, we found that 80% of them have used a restaurant app, which could show an increasing desire for convenience and mobile offers. Of that 80%, half of them use restaurant apps at least once a month. Most people don’t eat out every day, so having customers ordering food or looking at the menu on an app at least once a month isn’t too bad. If a restaurant can be one of those floating icons on someone’s phone, it’s a constant temptation and could lead to higher sales. For fast food apps, 86% of the survey takers expect to see location, contact info, deals, and online ordering readily available. 100% of the survey participants said there should be a menu. These results show that within our survey, most of the app users want the ease of online ordering, and the ability to save money with online-only specials. The main reason I personally use restaurant apps is to snag deals, so the responses make sense to me. This data also suggests that people expect fast food restaurants to have apps, because they seem to desire all of these options being available. Sit-down restaurant apps had different expectations from their fast food counterparts. From our survey, we found that most people (96%) want the location of the restaurant, and nearly 83% want contact information within the app. Since sit-down restaurants primarily offer slower, in-house meals, I’m not surprised that such a large percentage of people expected to see them. This time around, 72% of people wanted deals, and 62% expected online ordering to be available. This data can be taken one of two ways: online ordering is unnecessary for sit-down restaurants and their apps, or there is an untapped market for online ordering that more sit-down restaurants could utilize. For customers that want the quality of a sit-down restaurant meal but only have a small window of free time, online ordering could be the solution and may pull in a new audience. We asked our survey takers what restaurant apps come to mind first, and unsurprisingly there were a lot of pizza joints. The main responses were Pizza Hut and Dominoes, so again the need for convenient food seems prominent. The other responses consisted of sandwich shops like Jimmy Johns and coffee shops like Starbucks. One thing all these apps have in common is online ordering, directly available through the app. It seems that for a restaurant app to be memorable or to be top of mind, the best bet is to be interactive with the customer via online ordering. Giving the customers a way to place reservations could be a large selling point for sit-down restaurant apps, especially for those busy weekends when you wait an hour or so to be seated regularly. •	68% of Americans currently own smart phones according to Pew Research in 2015. 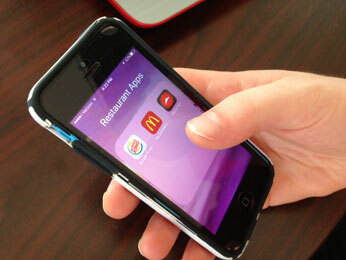 •	Restaurant apps need to meet people where they are, and millennials are on their smartphones. •	It’s not enough to have an app; mobile apps need to keep users engaged so they keep interacting with the app. This requires a strong marketing strategy. And this doesn’t just apply to large businesses; small businesses can flourish with apps too. While restaurant chains are known for their apps, it isn’t an exclusive club; a small business needs to make a strong impression by being found in the App Store. Stay tuned for our next blog, to show how a food cart can benefit from a mobile app.